Real Metal Chain Beaded Curtains from ShopWildThings add contemporary flair to any venue. Use them in retail windows or restaurant lobbies, and at galas, wedding receptions and homes. They are also Inherently Fire Proof, making them an excellent choice for venues with FR Requirements. Our custom panels come in widths up to 4', with any length chain that you choose. For wider spaces, we create multiple panels which are hung next to each other and appear visually to be one piece once installed. If you require a Fire Proof curtain, you're in the right place. 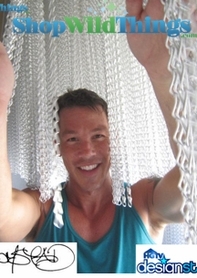 Just choose an Aluminum Chain curtain that does not include Acrylic Beads mixed in. We can make any size you'd like, or choose from the styles below. Each of these Curtains are made in the USA at our Arizona location by American workers. We are very proud of the quality of our work and welcome all custom orders! Each curtain will arrive assembled. Choose from a variety of patterns that we've come up with below, or choose from any of the beads that you see below and we will create the Chain Curtain of your dreams. Would you like Gold Lynx Chains mixed with a Round Hollow Chain alternating with Black Ball Chain strands? WE CAN DO THAT! At ShopWildThings, we specialize in Custom Orders. Just give us a call at 928.855.6075. Custom orders have a $75 minimum. So, you love the metal ball chain beaded curtains look but not the price tag? Here's a great alternative. Our Acrylic Ball Chain curtains are triple-dipped in metallic paint to give it that finish of real metal. They are lightweight so as to be easy to hang, but not so light that they look or feel cheap. We offer "faux" ball chain curtains in a variety of finishes and in lengths up to 12' long in stock and ready to ship. We can also always make longer lengths for you. Our custom panels come in widths up to 4', with any length chain that you choose. For wider spaces, we create multiple panels which are hung next to each other and appear visually to be one piece once installed. The colors of metal Ball Chain Curtains that we have in stock are: Bright Silver, Steel (Gunmetal finish), Crystal Iridescent, Black or Pearl White. We've just introduced our Metal Chain curtains below which are made out of aluminum. They ARE real metal, and are heavier. We are offering them in ready-made panels 3 Feet Wide x 6 Feet Long. We are also making any Custom Size for you In-House! Our custom panels come in widths up to 4', with any length chain that you choose. For wider spaces, we create multiple panels which are hung next to each other and appear visually to be one piece once installed. You'll find that NO ONE beats our price on these. Below, find our ready-to-ship curtains, or see our Metal Chain Curtain section. 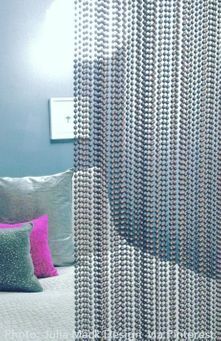 Ball Chain Beaded Curtains are now available in Real Steel Metal! You can purchase them in stock sizes, or by the square foot.We are making any Custom Size for you In-House! Our custom panels come in widths up to 4', with any length chain that you choose. For wider spaces, we create multiple panels which are hung next to each other and appear visually to be one piece once installed. You'll find that NO ONE beats our price on these. See our Real Steel Ball Chain section. We will provide expert craftsmanship right here in our American workshops to give you the very best service. We really love our customers. We're always delighted when you call. We're eager to help. Our how-to video at the bottom of this page on how to hang these gorgeous bead curtains will show you that it takes just minutes to get the perfect look you want. Two nails or two hooks are all that's needed to hang our wonderful bead-strand curtains from doorways or against party backdrops.� Our demonstration video is a delightful examination of all the variations you can use with our ready-to-ship and custom crystal-bead curtain choices. Our Cameo & Sammie chain and crystal curtain has 10 strands of aluminum silver chain and 9 strands of acrylic crystal garland with faceted beads to beautifully capture the light. The silver beads are 1-inch by 1/2-inch wide. The high grade crystal-cut beads alternate between 3/4-inch by 3/4-inch square beads and smaller rectangles half that size. The Cameo & Aces beaded crystal and metal curtain has 9 strands of aluminum silver chain and 8 strands of crystal garland with beads shaped like the Ace of Diamonds on a playing card. The silver beads are 1 inch by 1/2 inch in size. The Aces of Diamonds clear crystal-cut beads are a 3/4-inch square design. Please call us to place a custom order: 928-855-6075. Alternatively, you can email us using the Contact Us link above.